As an athlete, I can understand the pain you endure in your back. It can be uncomfortable at times and extremely excruciating at other times. Back pain can start as a mild, nagging pain and turn into a major pain in a matter of minutes so it becomes important to treat your back before the pain even starts. Before we get into the treatment talk let’s talk about why your back hurts so much. Back pain spawns from over-exertions and strains and this happens when tension is created within the soft tissue and muscle around the lower spine. Now that you are more aware of what causes your back pain, you can successfully treat it. There are many ways that you have probably heard of when it comes to the treatment of your back, but some of them are useless unless you do it exactly right. For some people, treatment with cold compresses is the best option but for others, the cold only makes the pain worse. You have more than likely experienced this for yourself. Typically, a warming process if used to treat back pain, usually through a warm bath or a hot bottle. However, there are many times when your back may hurt and you may be at work and cannot get into the bath or do not have access to a hot bottle. If this becomes the case and most likely it does, a lot of the time you do not have to turn directly toward medications for relief. Instead, there are warming pads designed to be warn around the back for immediate relief. They are designed for lower back pain relief through loosening up muscles and reducing inflammation. How Does Heat Help With Lower Back Pain Relief? Much of the time understanding how something works is the most beneficial factor to it working at all. First, heat expands the blood vessels within the muscles that surround the lumbar spine, which upsurges flow of nutrients and oxygen so that damaged tissue can began to heal. Second, heat is a stimulant to the body and since there are sensory receptors everywhere in the skin, heat travels very well. By applying heat, transmissions of pain that are continuously sent to the brain will decrease. Essentially, you are telling your brain, there is no pain here so stop fretting. Naturally, your brain listens and pain/discomfort decreases. Finally, through continuous back pain you may start to feel a sensation of being very stiff. It can affect you so much so that you might feel as though you have trouble simply getting out of the bed in the mornings. If this is the case, heat can also loosen up the stiffness and provide more flexibility and that is so important for a healthy back. Finding lower back pain relief is easier than most people think that it is and it starts with knowing how your back works and using heat on the right places. Medicine should only become an option when everything else has failed. There is a way to find back pain relief without soaking in the bath constantly or carrying around a hot bottle too. It comes in a wearable wrap-around and it is an essential product for your life if you are constantly feeling discomfort and pain. You do not have to live that way, not when the cure is just a step away. Just about anyone can suffer from lower back pain, although it seems to affect more people in the thirty to sixty year old age bracket. Often, lower back pain can be the result of over active athletes, but it can also plague those that lead a sedentary lifestyle, with little or no exercise, as well. It seems that as we age, our back and core strength may weaken, and therefor become prone to back pain, strains and sprains. Our muscle elasticity and strength may decrease, and our bones may no longer be as strong, as they once were. Our disks are also at risk, as they begin to lose their fluid and flexibility, thus resulting in a lack of cushion to our vertebrae. Sometimes, our pain may result for an actual injury or movement. Lifting an extremely heavy object may cause a spasm or strain in one or more of the muscles in your back. You may also suffer from a strained back while exercising, or participating in a sport. Sports can be particularly hard on your lower back and can agitate your lower back muscles by repeating the same movements, over and over again. Whether you are golfing, playing tennis, ballroom dancing, running, jumping or horseback riding, you lower back is at risk. As you age, your lower back pain may seem to increase in severity, as well as frequency. You must remember that there will be some degeneration in your body and scar tissue is also often present from past injuries. A strong core of abdominal muscles will help to protect your lower back from injury. Having a strong core will help you to alleviate lower back injury, by helping to support your body and helping to keep your spine aligned. A body with good, solid core strength is a strong and healthy, well supported spine; less likely to become injured. In the unfortunate event that you do have a lower back injury, strain or sprain, a highly effective lower back pain treatment is cold therapy. Cold therapy is not only therapeutic, it is also comforting. The cold therapy lower back pain treatment helps to reduce swelling and inflammation. It also helps to numb your lower back pain and helps you to be more comfortable. 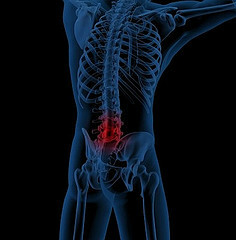 Lower back pain is often caused by the inflammation and the lower back pain treatment that helps the most during the first three days after the strain of injury is the cold pack treatment. Of course, lying around on lumpy ice is not really the most beneficial way in which to apply a cold pack treatment, to your lower back, so finding a way to keep a cold pack in place may be a bit tricky. A really unique and plausible way, in which to apply a cold lower back treatment has been created by Jox athletic shorts. These athletic short not only allow you to place the cold pack right where you need it, but they also keep it there! This is a great feat; no more slipping and sliding of ice packs, or bags of ice, that seem to drench you, know matter what you do. These athletic shorts will also help to support your core, which will help to reduce the strain on your lower back, helping you to recover more quickly. Jox athletic shorts are therapeutic undergarments that not only have a back support belt, and a support panel for your core, but they also have the perfect solution for a lower back pain treatment. They have devised a most sensible solution to keeping your cold pack in place. 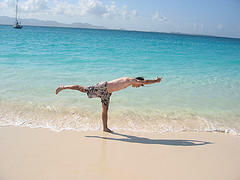 Even the most active and physically fit men experience lower back pain now and then. For many men, chronic lower back pain can be so persistent that it prevents physical activity, which further contributes to the problem. If you suffer from occasional or chronic lower back pain, patented Jox Athletic Shorts can provide the relief you have been seeking. Why Do You Experience Lower Back Pain? Lower back pain can result from injuries, poor posture, excess weight, osteoarthritis, and a range of other conditions. However, the most common cause of lower back pain is related to weak or fatigued core muscles. Core muscles help provide balance and stability, but more importantly, they also help support your spine. Weak core muscles from lack of exercise contribute to chronic lower back pain, but even men who are strong and physically fit can suffer. As your muscles fatigue during exercise, support to your spine is reduced, resulting in possible muscle strain, inflammation, and lower back pain. How Does Jox Provide Lower Back Pain Relief? The search for lower back pain relief is almost universal among those who suffer. Core strengthening exercises are typically recommended, but often are not sufficient. 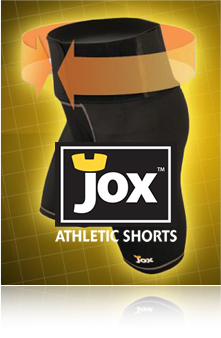 Jox Athletic Shorts help provide lower back pain relief before, during, and after exercise. Heat Therapy - Clinically proven to help relieve pain and stiffness, heat therapy helps increase blood flow to the affected area. Jox Hot Pax provide consistent heat for 8 hours, directly to the area of the lower back that is most impacted. Using Jox Hot Pax before exercise or any physical activity can help improve flexibility, reduce stiffness, and provide lower back pain relief. Core Support - The patented core support panel in Jox Athletic Shorts helps provide proper spinal alignment, even when core muscles are weak or fatigued. Using the support belt during exercise can help reduce or prevent lower back pain. Cold Therapy - Physical activity can cause inflammation in your muscles and joints, particularly in the lower back. Using Jox Cold Pax after exercise can help reduce inflammation, enhance recovery, and provide lower back pain relief. The ability to tighten the core support belt also provides compression, allowing the therapeutic cold to further penetrate the target area. Whether you're a weekend warrior or a dedicated athlete, Jox Athletic Shorts can help you stay active for longer while reducing the risk of injury. Even men who don't exercise regularly can benefit from this innovative product. The movements required while gardening, playing golf, even walking, can contribute to lower back pain. Wearing Jox Athletic Shorts and using the Hot and Cold Pax can provide the lower back pain relief you have been seeking. Lower back pain can be very hard to live with; it can be so excruciating that even sitting up can be a painful task. Lower back pain spawns from many different causes but most commonly from tumors, osteoporosis, spinal stenosis, herniated disc and spondylosisthesis. According to the National Institutes of Health, lower back pain is the second most common neurological disorder in the United States with headache coming in first. Lower back pain relief can be hard to find and what works for one person might not work for another person. However, just because back pain seems hard to manage, there are alternatives to medication. Certain medications can cause different side effects or even other health issues that leave you feeling even more pain. Medication should only be used as a last resort and should never be taken lightly. There are other ways to achieve lower back pain relief and it starts by living life more naturally. The old say goes, “natural is always best” and it is very true. Our ancestors had natural ways of healing, cooking and just generally living that far too many people left in the past. However, today, many people are starting to find those old ways of natural healing and are bringing them back to the forefront once again. Acupuncture is an age-old process of healing the human body and has been used for thousands of years. According to traditional Chinese medicine, pain occurs when energy is blocked along energy pathways of the body. By using acupuncture needles, those pathways are unblocked. Scientifically speaking, acupuncture releases natural pain-relieving opioids and sends signals that calm the nervous system and release hormones and neurochemicals. Yoga is process of exercise that allows for both flexibility and strength to be obtained through a creation of balance poses. It has many different healing attributes and is obviously great for the body; it has helped many to find lower back pain relief. While it might sound slightly odd, music is extremely powerful. Just listening to music, a person is depressed can find happiness and a person suffering pain can find amazing relief. Through studies, music has also reduced anxiety and disabilities as well. Capsaicin can be found in Chile' peppers, it is actually, what adds the spiciness to the peppers themselves. For healing purposes, capsaicin has been formed into a cream for applying to painful areas such as the lower back. Vitamins are great a healing for the body, it is the most natural way to give the human body what it needs and without those vitamins, humans start to feel very sick or even begin to hurt. Vitamin D defiency is very common among people, although a study shows that it is more common among people who are 30 or younger. Without enough Vitamin D in the body, muscle pain can happen and for many, it starts in the lower back. The most efficient way to get enough Vitamin D in the body is through natural sunlight. Not having enough B-12 within the body can also cause problems such as depression, irritability and mild memory impairment. It can also cause body pain as well. To make sure you are getting enough vitamins regularly, a vitamin supplement should be taken. Natural healing is the best way to make sure you stay healthy without the stress that manmade medicine can inflict on the body. However, there are times when natural does not work however.